- Like all Eakin® products, Eakin® Cohesive® Paste contains no alcohol in its non-sting formulation. - It is a skin friendly product that could be used even on sensitive skin, including babies, to help prevent skin irritation. - The use of Eakin® Cohesive® Paste aids leakage prevention by helping to form a waterproof barrier around the stoma. - It also absorbs more moisture than competitor pastes, helping to prevent skin maceration. - Due to the absence of alcohol, Eakin® Cohesive® Paste will not dry out. This enables a quicker pouching regime as you can apply the pouch immediately - there is no need to wait for the paste to dry before application! - The use of Eakin® Cohesive® Paste can help to heal red and irritated peristomal skin. 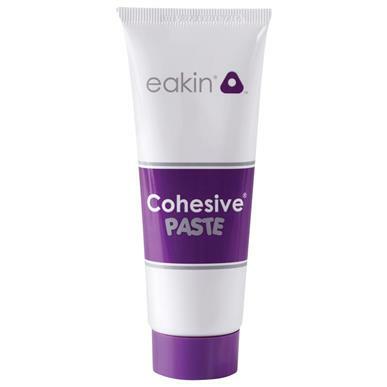 - Eakin® Cohesive® Paste is used to fill all crevices, skin folds and scars in order to create an even pouching surface. - By creating an optimal pouching surface this improves the likelihood of good adhesion and helps reduce the risk of leakage, thereby increasing pouch weartime. - Eakin® Cohesive® Paste can be used in conjunction with all Eakin® products. It is based on the same. - Cohesive® formulation which is found in Eakin® Cohesive® seals and Eakin Fistula and Wound Pouches. Part of the Eakin® Cohesive® family of products that have been protecting peristomal skin for decades. Sold by the each, one 2.1 oz tube.